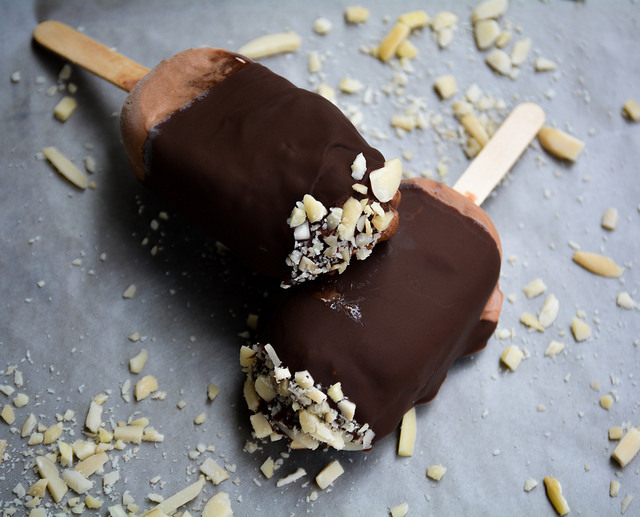 After your ice cream has completely softened (should just be on the verge of soupy), fill your 4 mini ice cream bar cavities. *Be sure you insert your mini sticks included in your kit into the designated space before pouring in the ice cream. Place in the freezer for a minimum of 3 hours. Then, melt chocolate chips with the coconut oil over low heat (Constantly stirring so it doesn’t burn) in a small saucepan. Once fully smooth, pour into a mug and let cool for 2 minutes. place crushed almonds on a small plate. Dip each ice pop 3 quarters of the way into the mug and turn to coat, lightly shake off all access chocolate. Then dip the top into crushed almonds. Place the ice cream bars on parchment paper. Return to freezer for 2-3 hours and then they are ready to be served. TIP- keep in an air tight container in the freezer for 1-2 weeks. I scream, you scream, we all see where this is going…. I absolutely love ice cream on a hot summer day. It has become even more of a “delicacy” as I have gotten older because I rarely allow myself to indulge. I’ve also moved towards a very limited dairy filled diet (ice cream doesn’t bode well for that criteria). For anyone who is like me who still likes the occasional ice cream treat, wants to stay on track with their diet and/or is dairy intolerant, today’s recipe is exactly what you are looking for!!! I was introduced to Luna and Larry’s Coconut Bliss ice creams a few years back. With few, whole ingredients, it was an easy brand to get behind (This is not an ad in any way; I just love their ice cream SO much!). The dark chocolate flavor is my favorite and it honestly eclipses any full flavor ice cream I ate previously, it’s just that good. The coconut cream base adds richness to the chocolate flavor. Yet, the coconut flavor is not overwhelming and you probably won’t even be able to pinpoint that it’s not regular dairy at all! This dark chocolate ice cream paired with a crispy chocolate outer layer is SO on-point. Just a shout out to another favorite ingredient of mine, Enjoy Life chocolate chips (They are completely allergy free and dairy free) which are used for the coating. But, first let me introduce the handy little tool that made this popsicles possible. While reading another favorite blog of mine I saw that they used the brand Silikomart. This company makes silicone molds for ice cream that make it SUPER easy to make your favorite treats right at home. I went right on Amazon and bought a mini bar set for myself (once again, not an ad, I truly purchased my own to try out!). The first try was just that easy and I’ve used quite a few times now to literally feed my ice cream bar addiction. You can really use ANY ice cream, any flavor, any brand you want! 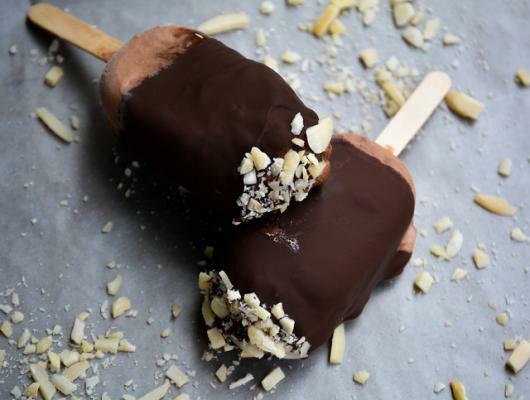 Pour the melted chocolate into a mug and DIP the popsicles for best results (even coating).